I had just an hour today to block out where the boats are, and add detail to the cliffs. 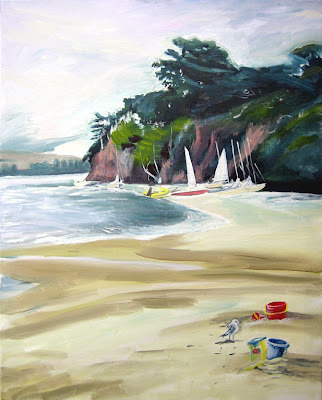 This painting will become a collage of 3 or more photos I took at Heart's Desire Beach, Pt. Reyes National Seashore, in the summer of 2005. The people on the beach will be from separate photos, and I may add a bird flying into the forground from a third image.